Aguila is famous for this particular 22LR cartridge. Typical 22 ammunition has a 40 gr. bullet. 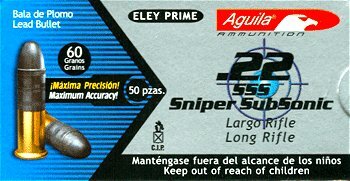 The Aguila SSS Super Sniper has a 60gr bullet... That's Heavy! Typical velocity is right around 950 fps, Totally Subsonic... But it hits game Hard and Lethal. Subsonic 22 LR ammo is preferred by many small game hunters. The 60 gr bullet may be too heavy to stabilize in some 22LR firearms. We recommend that you try one box in your gun before investing in several boxes. We also have special "Fast Twist Rifling" barrels for the Ruger 10/22 that are designed specifically to stabilize subsonic ammo like the Aguila SSS Super Sniper. See all of our subsonic 22 ammunition at our EABCO 22 Ammo Page. Good ammo. Because it is sub-sonic a simi-auto weapon may not cycle, this has happened only a few times. If you a suppressed weapon this great ammo. You must be 21 years or older to order ammunition. Due to DOT regulations, we cannot accept returns on ammo. Please check local and state laws before ordering.